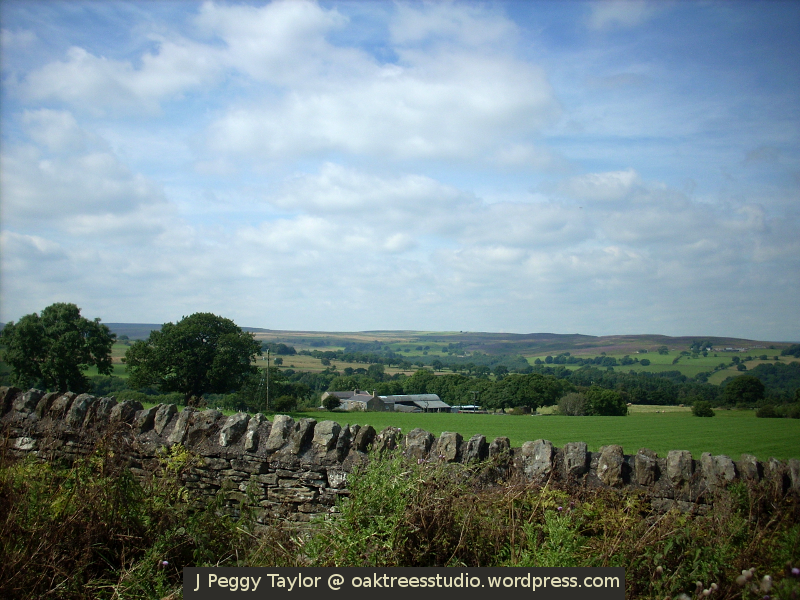 I’ve been missing from the virtual world this week. I’ve been fighting a battle – well, two, actually. Though, the second one required me to call up the cavalry. 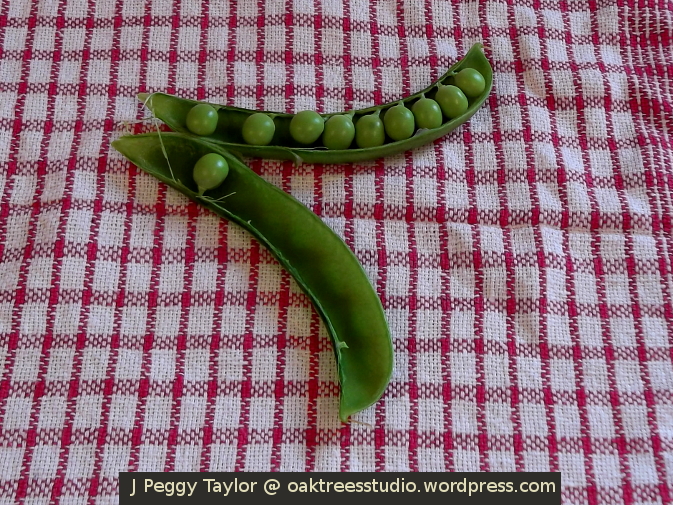 Did you see my beautiful fresh garden peas on my Wordless Wednesday post last week? This is the image here if you missed it. 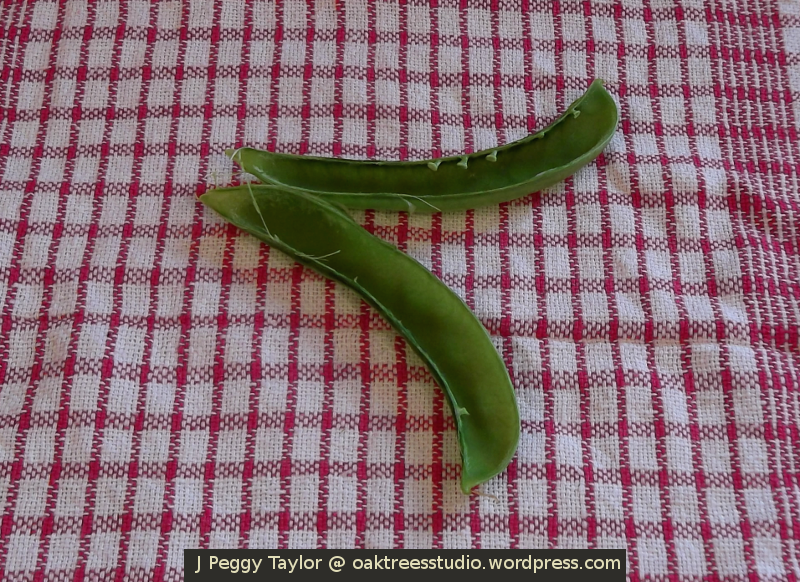 I’ve been carefully watching the pea pods gradually plumping up and this was my ‘test pod’, to check if my tall garden peas had fully grown and were ready to pick. A pod-full of bright green, sweet, juicy peas – just right and just ripe for picking. There were quite a few pods at this stage now, so I was looking forward to my first Champion of England tall pea harvest. The next morning, I went off to pick my peas. But OH NO! Horror! My beautifully ripe pods of peas had already been picked! Well, not as much ‘picked’ as pecked! This was the sorry sight that met my eyes on my tall pea frame. Lots of ripe peas ripped away. 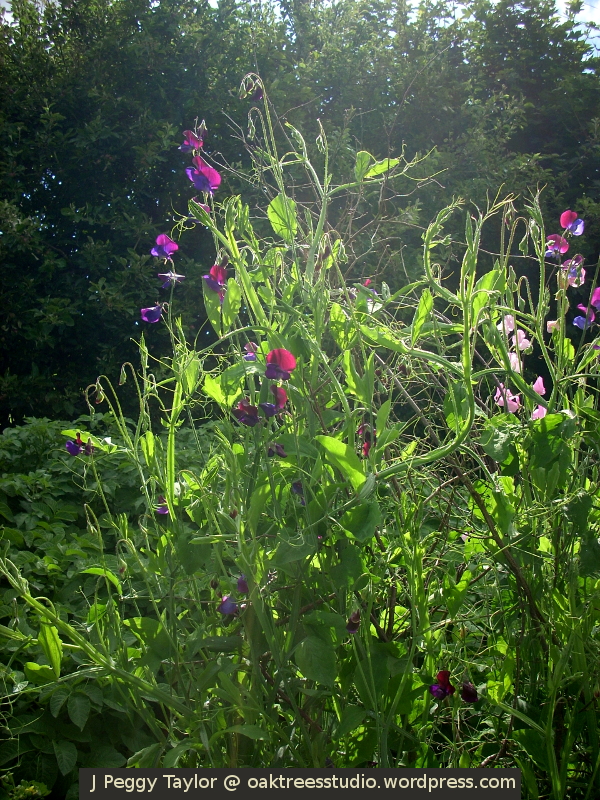 Some of the pea plants were mangled too – evidently visited by a stampede of starving birds. 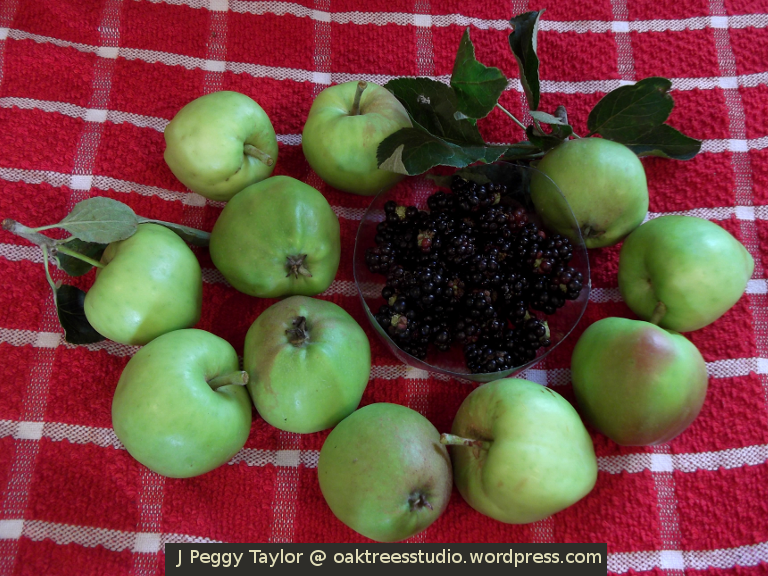 I was initially inclined to blame the local population of jackdaws, as I’ve previously encountered them pea pinching. 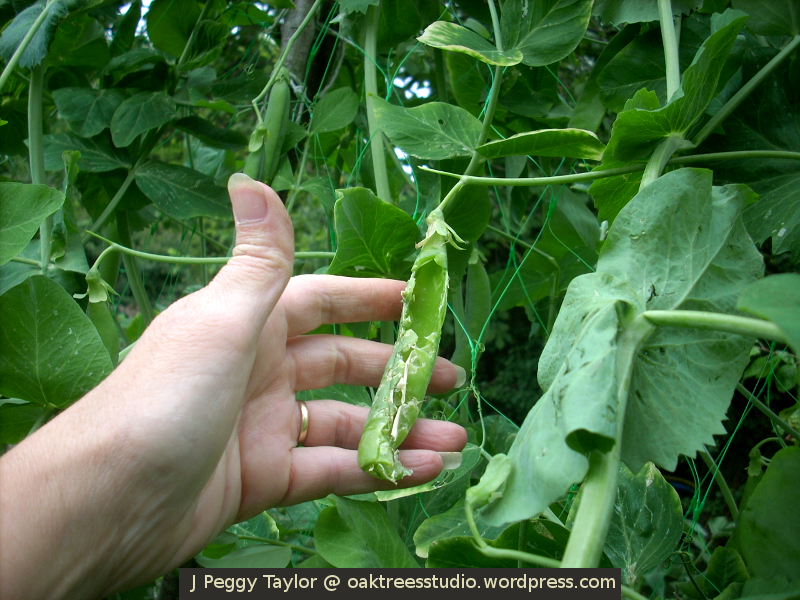 But then I began to think the amount of damage there’d been to the pea plants, this must be the work of heavier birds. I then believed the wood pigeons must be responsible. However, the witness for the prosecution was quite certain – definitely the jackdaws, and very persistent they have been too! 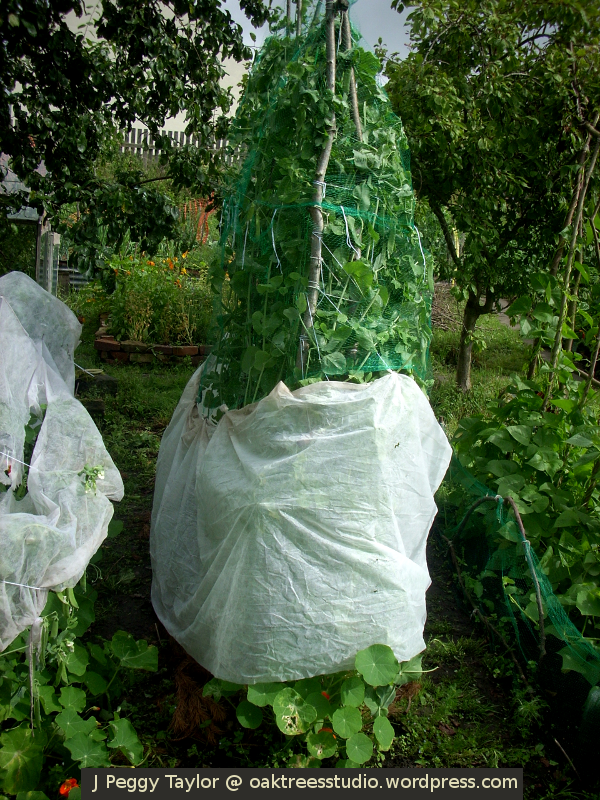 The first of my counter-offensives saw me covering the whole of the tall pea frame and the growing pea plants with a combination of garden netting and fleece (in the pouring rain, of course!). Did this work? No, not good enough! Next, I added willow hoops to hold the netting away from the pea plants. Still not good enough! I then added unstable hazel twigs on the outside of the willow hoops and the netting. Promising at first, but still not completely effective. 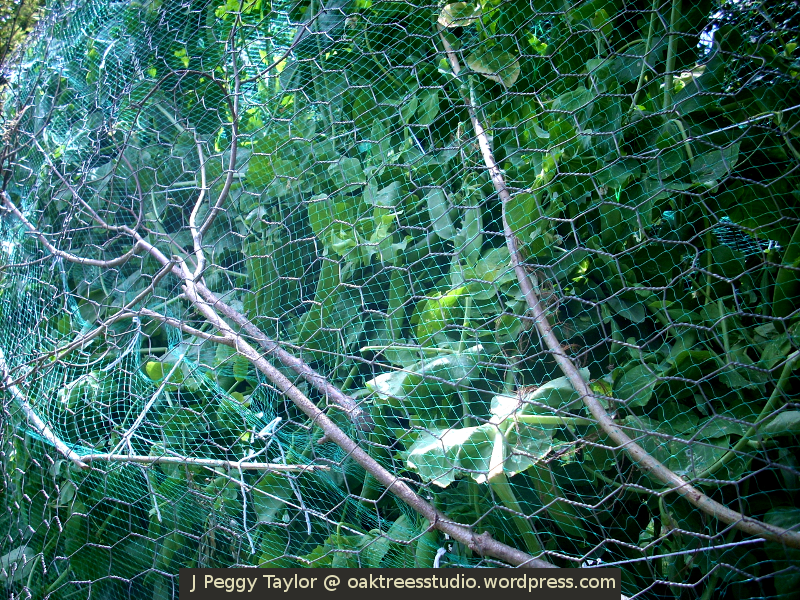 Now, hopefully, I have added the final layer of defence – chicken wire! With each additional layer of defence, it’s certainly becoming more difficult to pick the peas … not only for the jackdaws, but also for me! My other battle this week has been against a machine … my desktop computer to be precise. At the end of last week, I’d carefully prepared to upgrade my computer’s operating system. Early in the morning that Saturday, I hit the upgrade button. For the first two hours everything went smoothly. I was completely in control. Then, boxes began to appear. The boxes said things like, “failed” and “cannot complete the upgrade”. Before I’d managed to digest the first message, succeeding ones appeared much too quickly. UGH! There was nothing else for it, I’d have to call in my tech team. “Are you busy, dears? I’m afraid something’s gone wrong,” I called up the stairs. My children came to the rescue. My carefully planned upgrade was now in tatters. I don’t consider myself entirely useless with computer software but my two teenage sons are invaluable when things do go wrong. Rather like my ‘pea wars’ against the jackdaws, we devised a battle plan against the computer. For Cee’s Black & White Photo Challenge this week we are looking at large subjects. ‘Large’ is a relative term. To appreciate the scale of a subject, we have to look at size compared to something else. The large subjects I have chosen from either the built or natural landscape are all quite substantial … at least compared to a human. 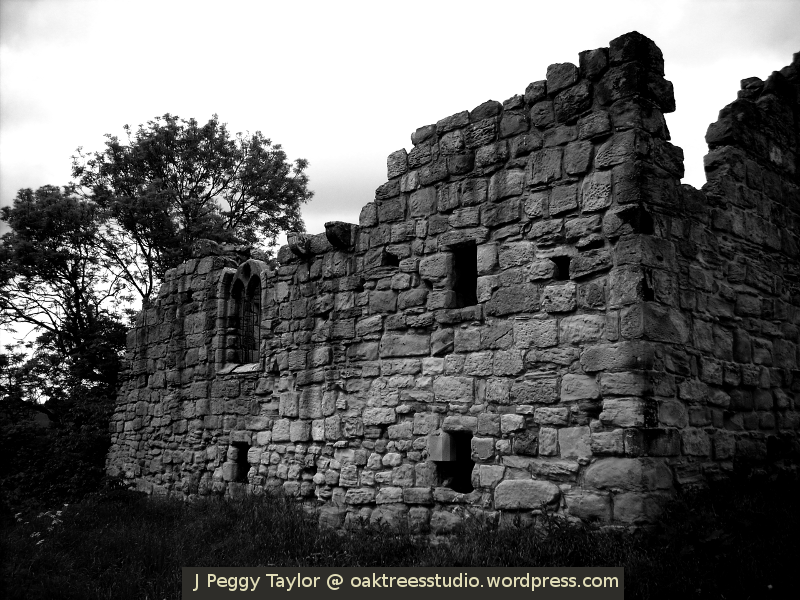 This medieval manor house was three storeys high and even the remaining ruins are quite impressive. In this image, you can see the scale of the building compared to the oak tree immediately behind it. 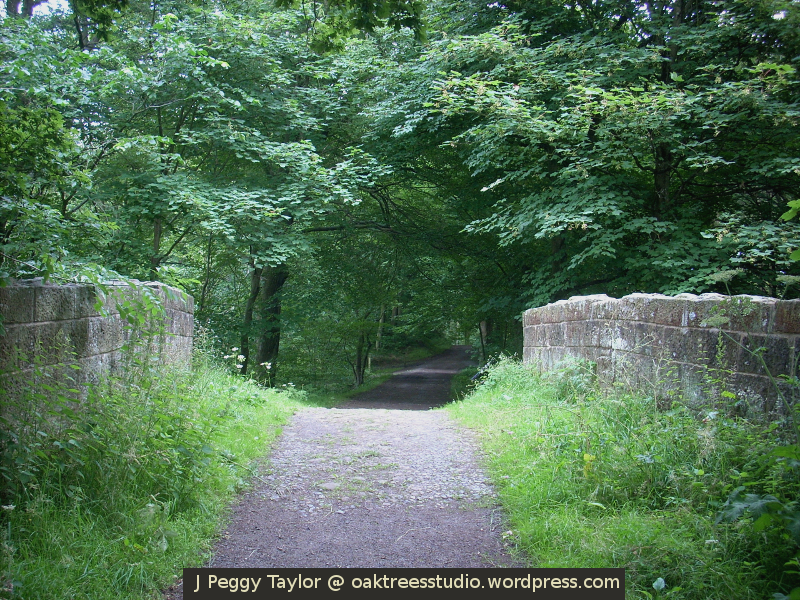 This Victorian railway bridge has been built very tall to accomodate the contours of the ground here on the banks of the River Derwent, so that the railway could be constructed on a given level. You can see the scale of the bridge compared to my son who is walking underneath it. 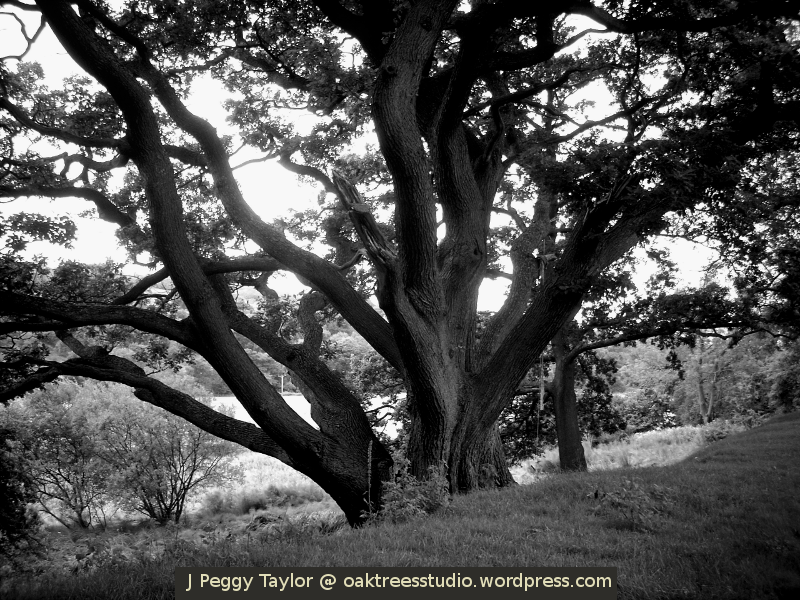 The Broad Oak gives its name to the farm on which the tree stands and what a magnificent ancient oak tree it is too. The scale of the tree can be deduced from the other trees and bushes in its vicinity. 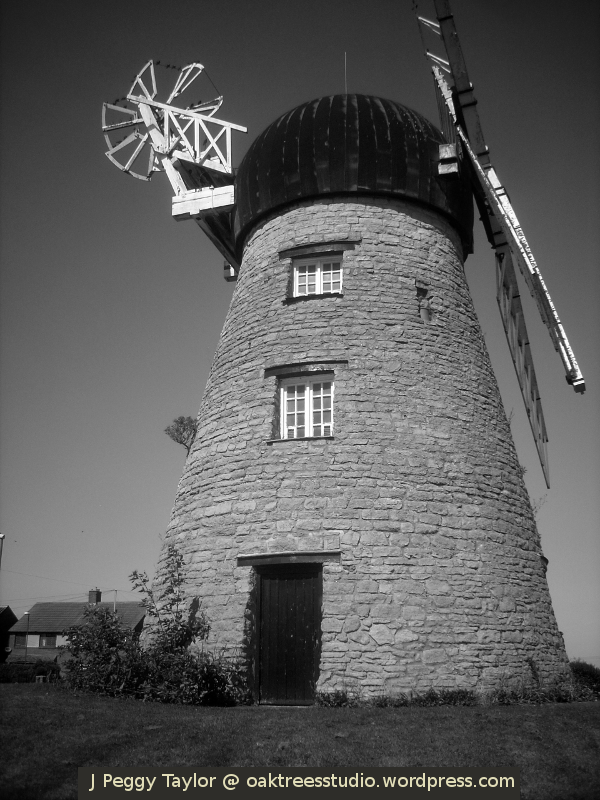 Whitburn windmill is a restored 18th century flour mill and now it towers above the new housing nearby. Do take a look at the large subjects others have found for Cee’s Black & White Photo Challenge this week. 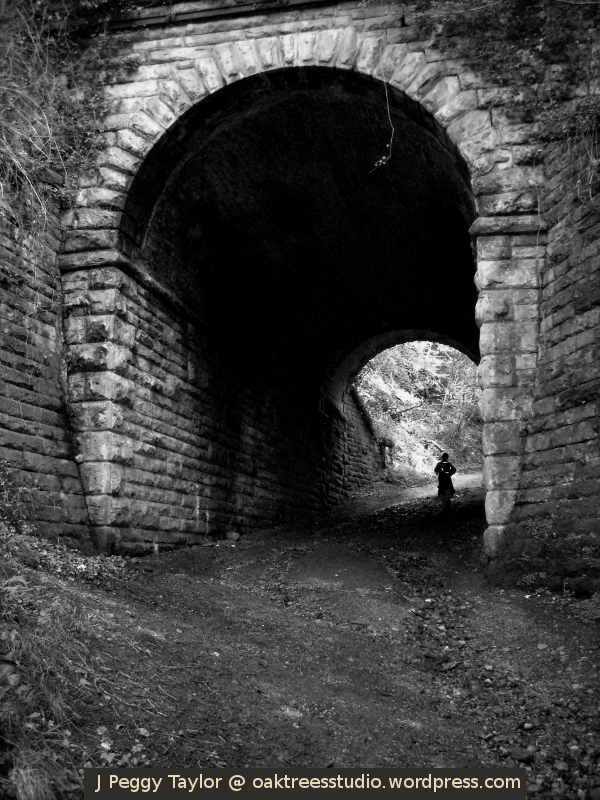 “Older than 50 years” is the topic for Cee’s Black & White Photo Challenge this week. Rather than root about in my photo archives, I decided to have a root about in the old shed in my new allotment garden. I found all kinds of old treasures and photographed them on the old cupboard that doubles as a bench and storage space in the garden shed. The old shed itself definitely falls within this week’s topic. Originally, this building was constructed as a garage, probably shortly after World War II. I remember there were some old garages of this type near where I lived as a young child, back in the 1960s. The garage was probably saved from demolition and then transported to its current location and repurposed as a garden shed. 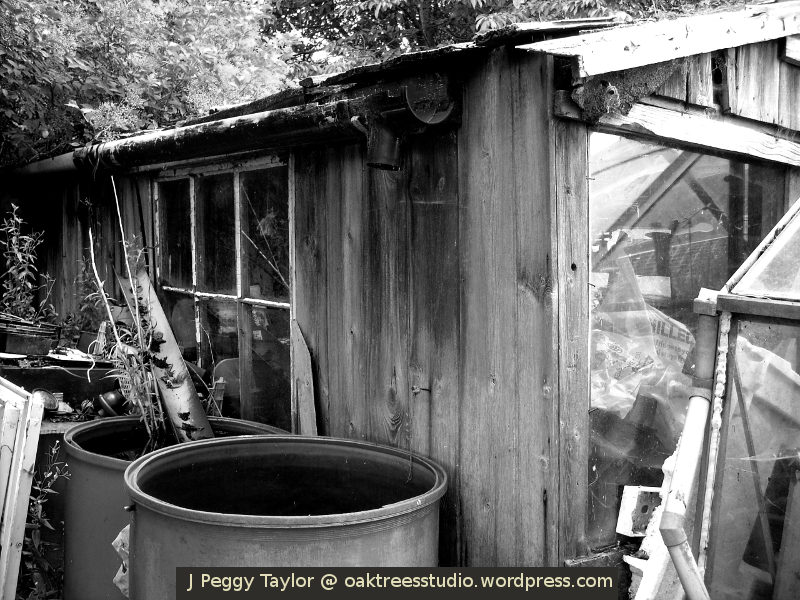 I love the smell of old garden sheds – the mingling aromas of musty dampness, machine oil and old creosote wood preserver, all mixed up together. Rust, dust and cobwebs cover the array of relics left behind from a by-gone age. Before hand drills were made in moulded plastic and powered by electricity, these are one of the tools people would have used – a brace and bit. I know some woodworkers still use these tools today as we bought a brand new one for our woodworking son a couple of years ago. These old and rusty hand braces hang from one of the old shed beams. One of them still has its ‘bit’ in place – I wonder what it was last used for, and when? In years long gone, shoes were made of leather and people mended their own at home … or in the garden shed, apparently! This rusty old shoe last would have been used to support the shoe whilst it was re-soled, or re-heeled with new material. Here in our village, it’s very likely that the last was used to mend the pitmens’ heavy boots that they wore when working in the coal mines. 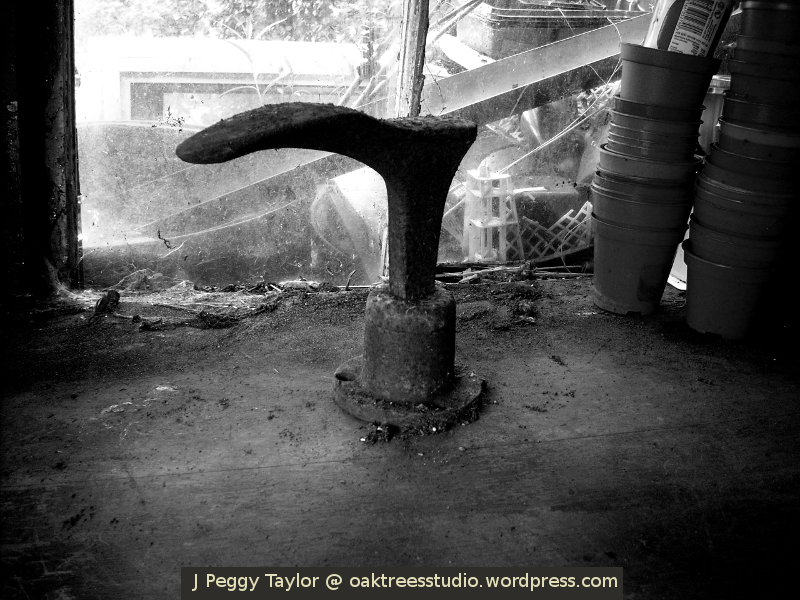 Can you hear the ghostly echo of the shoe mender’s hammer as he taps in the new nails? Wood turning is a heritage skill that we’ve learned a bit about in our family. Our youngest son went through a keenly interested phase and he and I ended up building a treadle-powered pole lathe from raw timber, which was a wonderful learning experience. 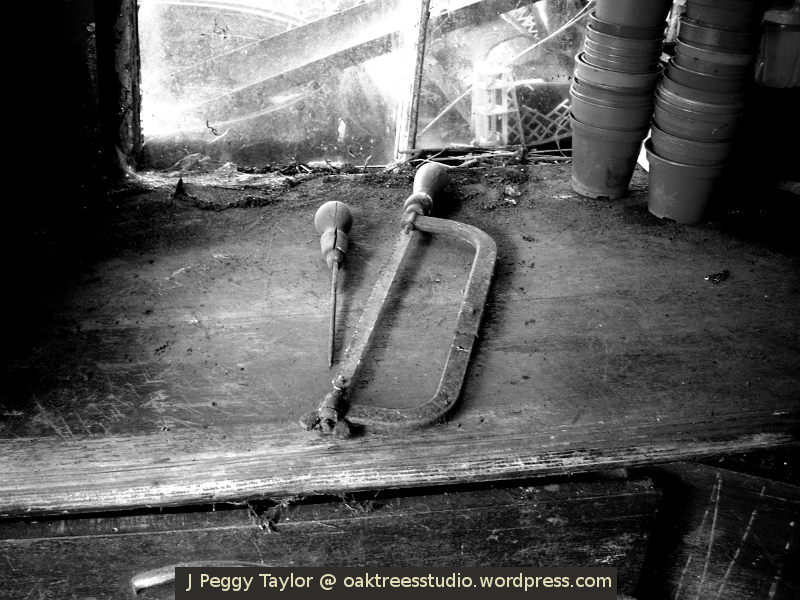 In the old shed, I came across these very old hand tools with turned wood handles and they reminded me of our wood turning project. You don’t often see tools with turned wood handles nowadays as moulded plastic has become the norm. 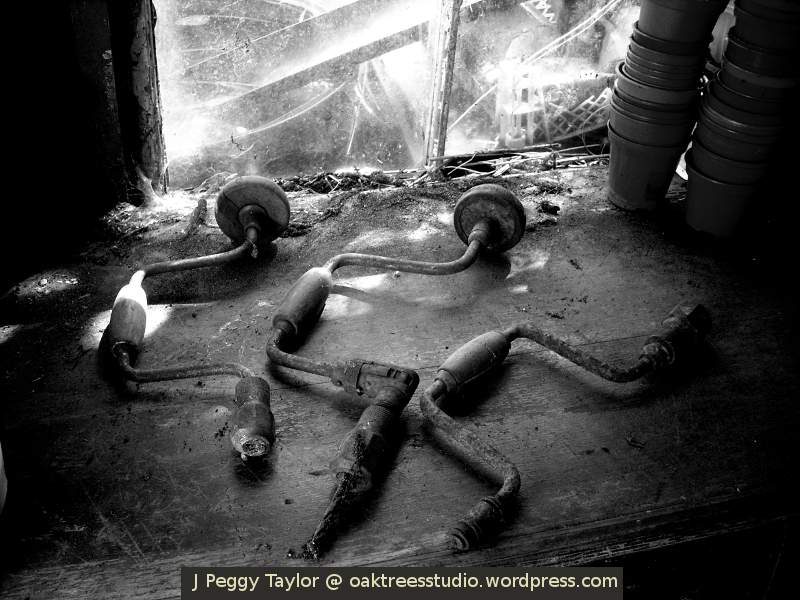 I had fun exploring in the old shed for this photo challenge … and it provided a welcome cool space on a particularly hot and sunny Summer’s day too! Do take a look at what old treasures others have found for Cee’s Black & White Photo Challenge this week. One of the special moments in the gardening year is digging down into the earth to harvest your very first batch of first early potatoes of the season. In the shops, these early potatoes are known as ‘New Potatoes’ … but there is nothing like the the taste of delicious earthy tubers you have lovingly raised yourself. ‘First Early’ potatoes are simply the type that are normally planted earliest in the year and are therefore ready to harvest first. The ‘First Early’ potatoes I chose to plant this year are the Pentland Javelin variety. 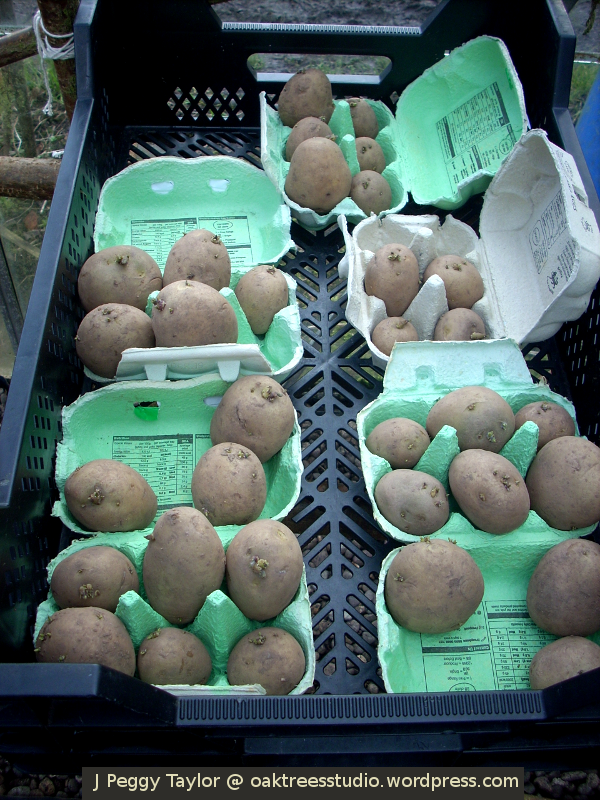 Back in the cold days of January, I took delivery of my Pentland Javelin ‘seed’ potatoes and set them up on cardboard egg boxes to ‘chit’. ‘Chitting’ potatoes means leaving them in a light, frost-free place to start sprouting little shoots from the potato ‘eyes’. 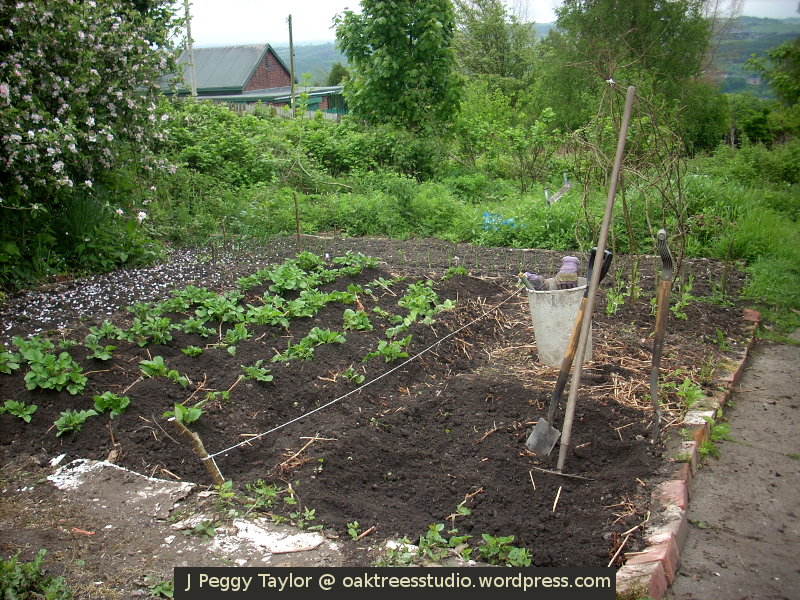 Here in the northern UK, we would often expect to be planting out our first early potatoes during March. But with our cold Spring, this wasn’t possible this year. My Pentland Javelins sat patiently in the greenhouse until 11th April before I felt the Winter had sufficiently turned to Spring to risk planting out my first earlies. 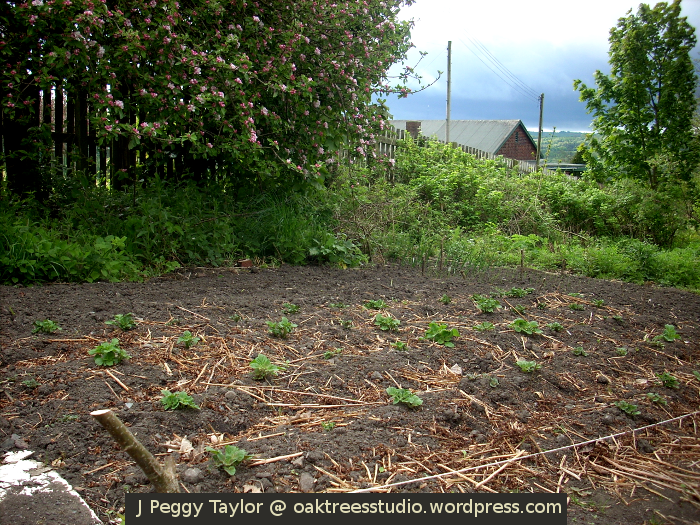 Each seed potato is set into its own little planting hole on a bed of fresh green Comfrey leaves. For me, this is another indicator that it’s time to plant my early potatoes – when the Comfrey has grown enough leaves to make the potato planting hole beds. I add Comfrey leaves because Comfrey is a wonderful natural plant food that feeds my growing potato tubers as the Comfrey leaves break down in the soil. I’d also added a good helping of garden compost to the planting row, as potatoes really benefit from a nutrient-rich soil. But then … oh no! Two weeks after I’d planted my early potatoes, the Winter returned with a final icy blast! 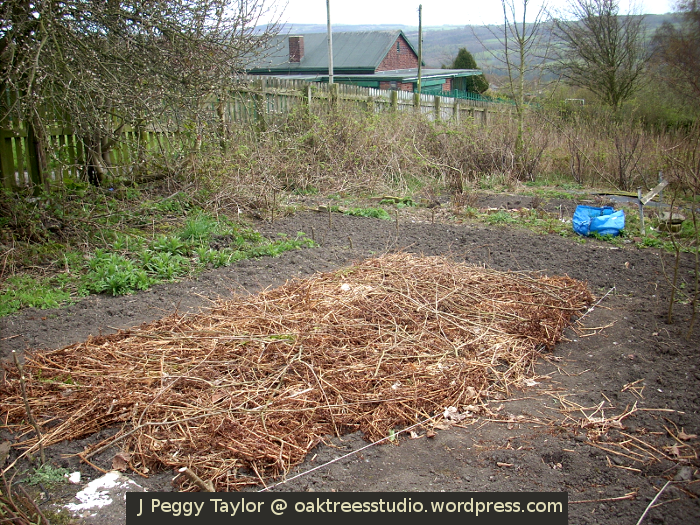 I had to dash off and collect bracken to cover over my already-planted potato bed. The bracken mulch provided its protection beautifully – though, I did leave it in place for a few weeks … just to be on the safe side! 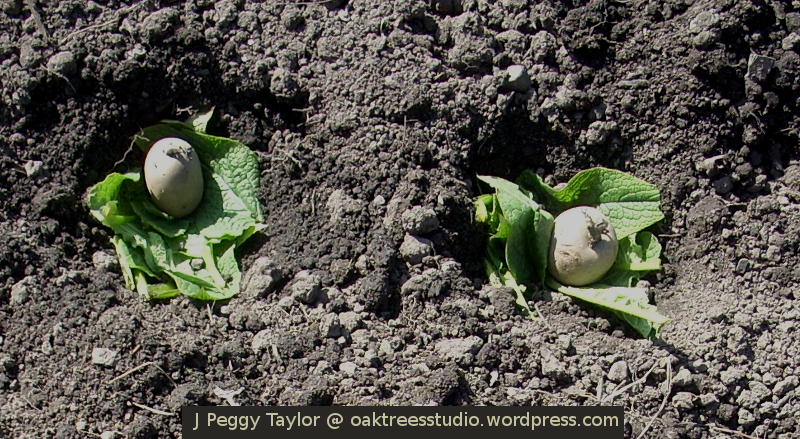 Gradually, the green shoots of the potato ‘tops’ began to push up through the soil. By mid-May all of the potato plants were showing some green leaves. We had some heavy rain leading into the Bank Holiday Weekend at the end of May and this ample watering produced something of a growth spurt in my potato plants. 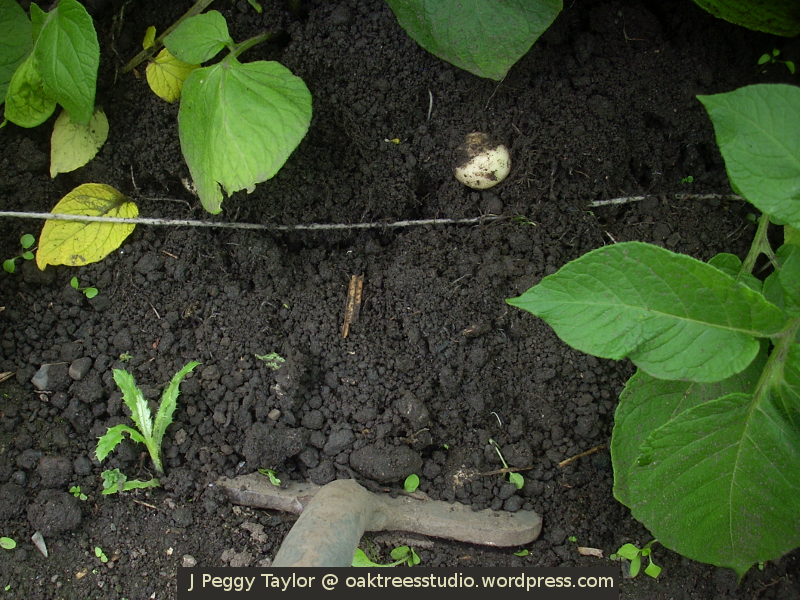 This meant my task for Bank Holiday Monday was ‘happing up’ the potato plants – otherwise known as ‘earthing up’ – which involves drawing up the soil around the potato plants, leaving a small tuft of green leaves sticking out at the top. 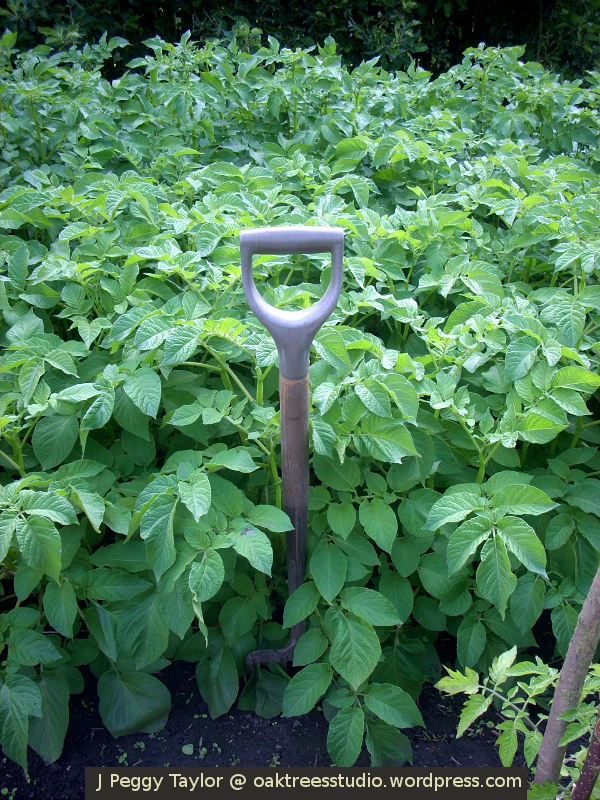 The potato plants then grew, and grew and grew … the potato tops were like trees! The potato tops became a regular topic of conversation on the garden. 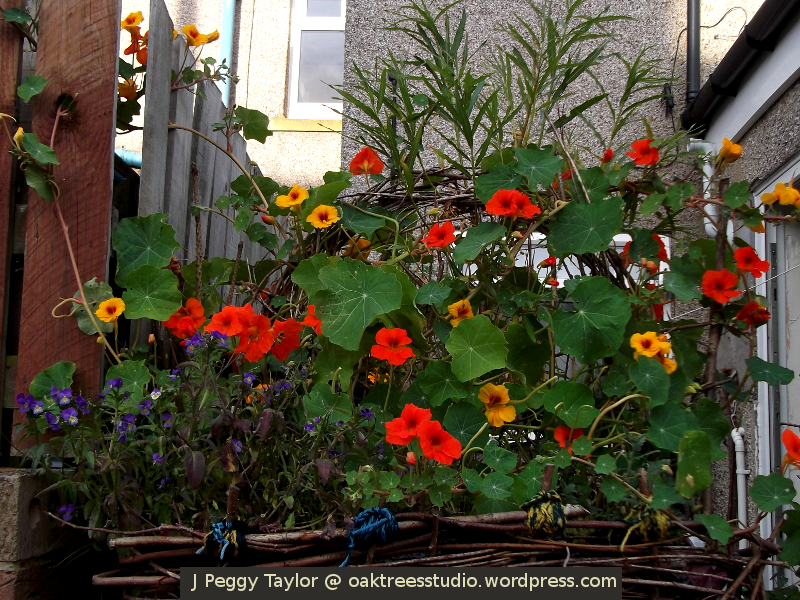 By the end of June they had grown as tall as the garden fork! 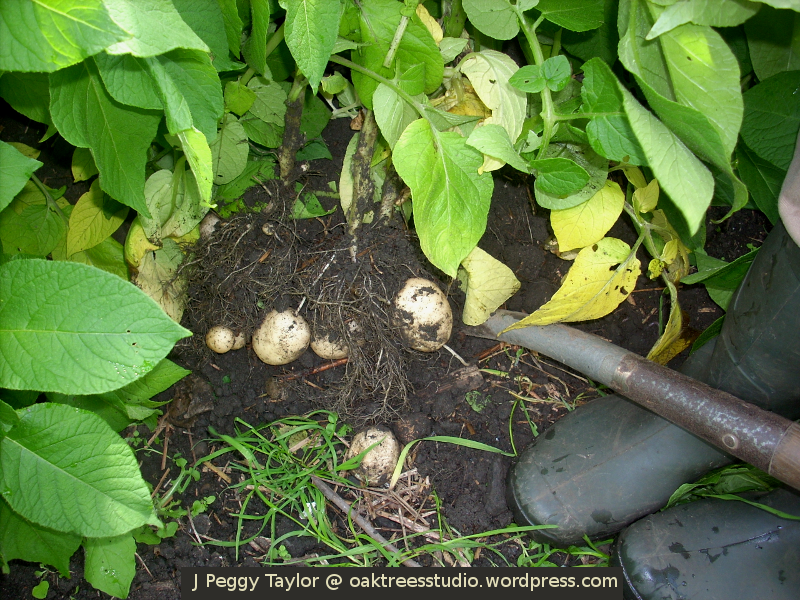 The very first tuber – are the potatoes ready yet? Now it was time for the Big Question – the exciting part. The tops were well grown. The flowers were beginning to show. But were my early potatoes ready to harvest? All the signs were there, though I still wasn’t quite sure if the potatoes had been growing long enough. Full of anticipation, I dug up my first Pentland Javelin potato plant. There was my first potato! When I dug in further, I could see there were a promising number of tubers growing, but, as I’d suspected, they were still a bit too small. I would need to be patient and wait a little longer. 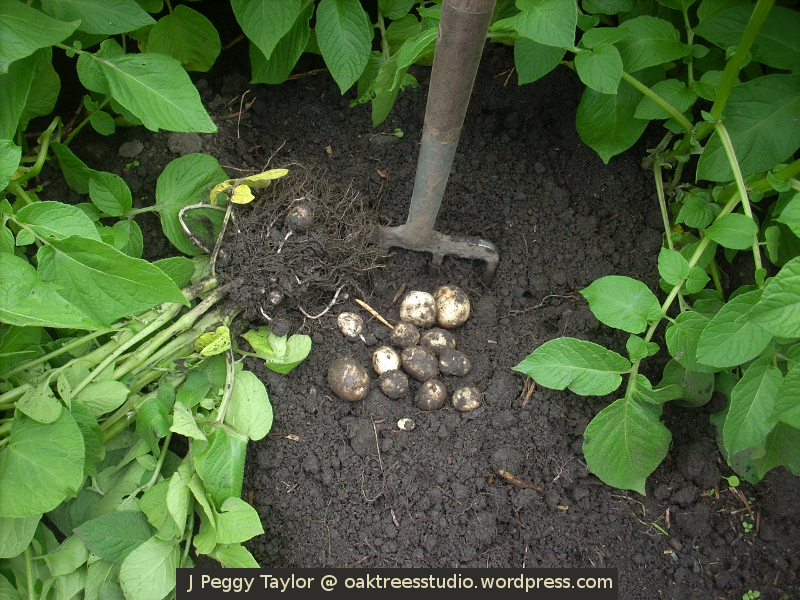 Two weeks into July was the Big Day – my first potato harvest in my new garden space. 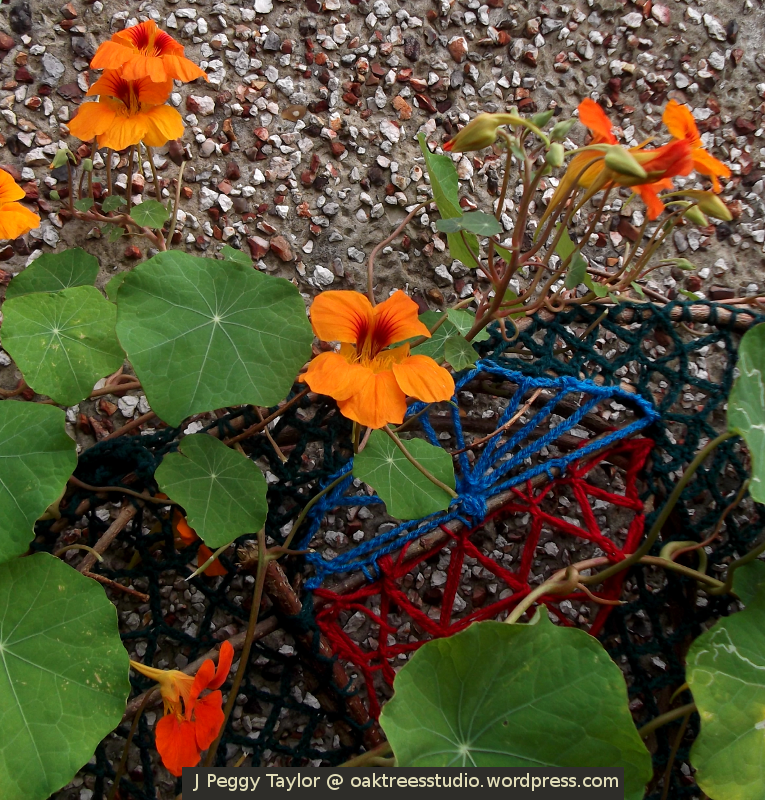 I selected two plants with open flowers and dug in with great expectations. I wasn’t disappointed this time. Each plant produced a selection of decent sized tubers. 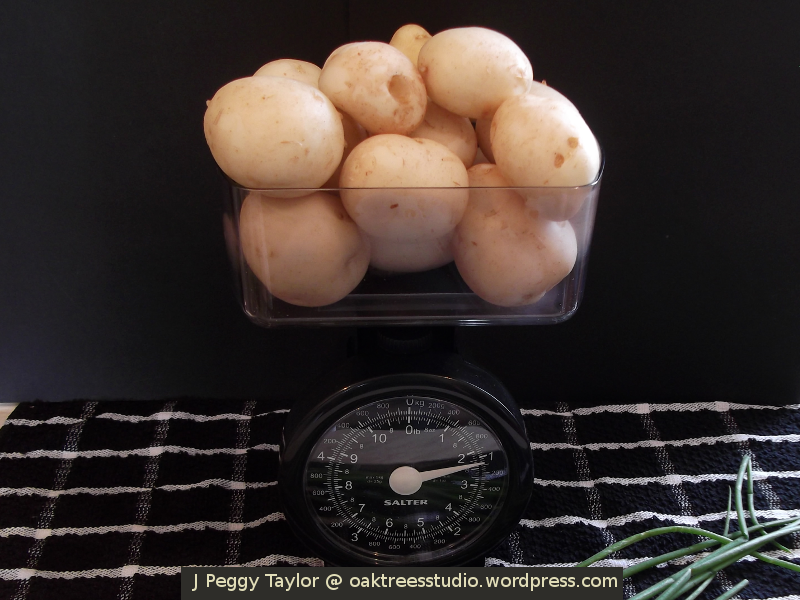 When I returned home with my first cargo of newly harvested potatoes, I weighed them. There was about a kilo of potatoes from the 2 plants.